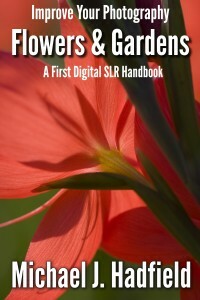 My first photography book is out there in the world and available for download on Kindle. It was published yesterday and has already sold a copy. Even stranger is that, as I write, my book is now ranking at a lofty #3 in the Kindle category Photography > Nature & Wildlife, #13 in Beginners > How to, and #38 in Digital Photography. All of which is a complete surprise to me. Such a rapid elevation in the rankings was not anticipated. As usual with my books, it took three times as long to write as I expected, and ended up twice as long as I planned. I had a bit of a glitch part way through where I was worried that my enthusiasm for the subject was failing to show through. A chat with a friend about the problem, a few edits and I was happy. The problem was not as big as I feared. My desire was to write an introduction to digital photography but with a specific focus. I selected Flowers & Gardens since that is possibly my favourite out of all the things that I like to photograph. I really wanted to just get straight into the fun part and write about flowers and light and stuff, but then I remembered beginners don’t necessarily know all about those exposure things like f-stops and shutter speeds and ISOs. The really unfortunate part is that unless you know about f-stops and shutter speeds and ISOs your photography will struggle to improve since knowledge of these things is essential to exert control over the appearance of the image. Yes I know you can put it on Program mode and machine gun away and you’ll probably end up with a useable shot or two – but there’s no skill in that. So I just had to write about exposure. And it isn’t very exciting. And it has to come first. 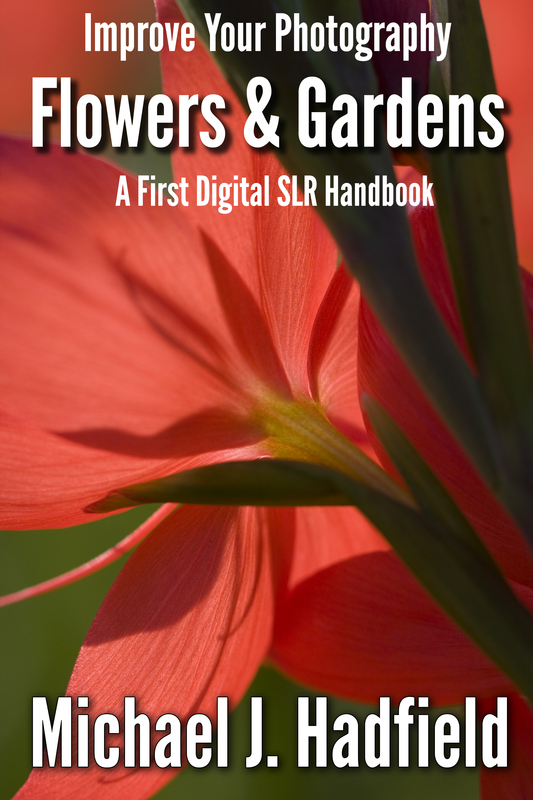 My concern was how do I communicate this information in the early part of the book without putting people off who just want to know how to take better pictures of flowers & gardens. So I started with a story. Readers like stories, so I wrote a bit about me and my photographic journey from a 10 year old with a Box Brownie waiting outside Buckingham Palace to standing in W.H.Smith (newsagent) and looking at the latest issue of a magazine with my image gracing the cover. Even threw in a few nostalgic links to the equipment I’d used. After the exposure stuff was over, it was down to the serious business of the flowers. And that was much harder to write than I expected. It’s not that flower & garden photography is some mystical intuitive process – it just feels like it. I had to think very hard about the processes that seem so natural to me when I have my camera in hand and a beautiful garden to explore. But they aren’t natural, they are simply the result of many hundreds of hours looking, clicking, observing results, and then going back and doing it all again – only better. I hope I have managed to distil the essence of what that process is and communicate, in simple terms, how to emulate it. 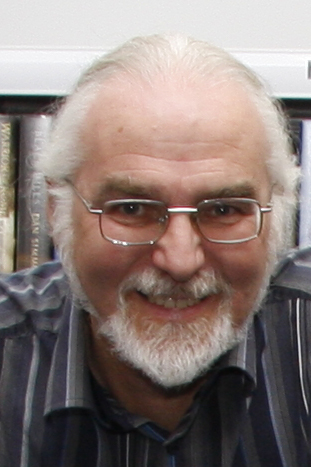 If I have, then my readers will be enjoying a dramatic improvement in their photographic skills. I met Cath when I joined a local meditation group called Lightworkers of Liverpool. Being a photographer, I felt drawn to a group with a name like that. Anyway, Cath wanted a wall-sized photograph to gift to her daughter, so that she would have something special as a memento of her Mum. So we arranged a date and Cath came to visit. I use half-size background rolls because my studio is quite small, but it’s fine for waist up or head shots. 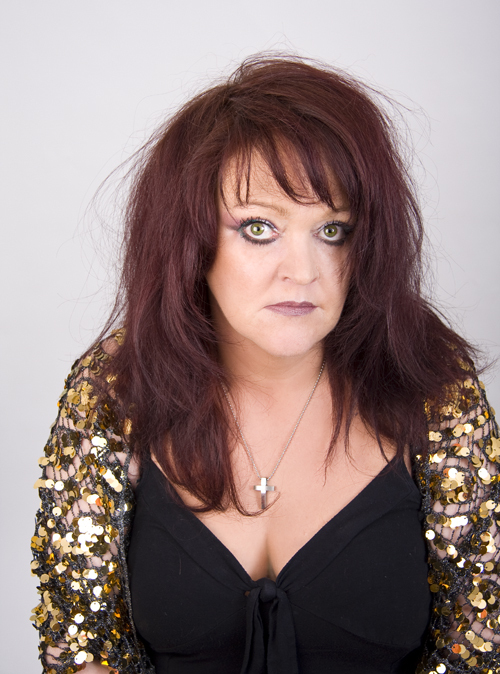 Cath was uncomfortable sitting in front of the camera and worried about what she would look like. The first images reflected this and it was quite a while before Cath began to relax and the images started to move towards something that would not only look good on the wall but give pleasure to Cath and her daughter. My usual strategy is to keep shooting and tweaking the lighting, eventually everyone begins to settle down and feel more comfortable. Few people feel comfortable being the focus of so much attention and that, along with the strange environment with coloured backgrounds and bright lights on stands, makes it difficult to look comfortable. But that is only initially. Once people begin to feel comfortable, then is the time to start the real work of capturing an image that is a reflection of who they believe themselves to be. Out of the first set this is the one that Cath liked the most. 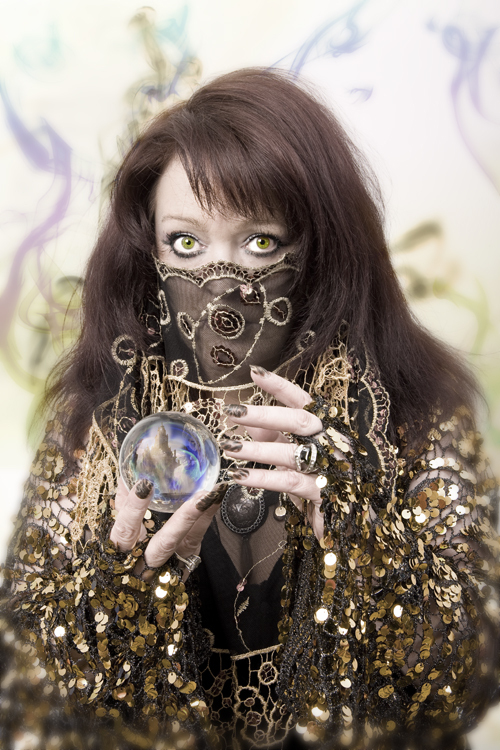 Cath also wanted an image she could use in promotional material for her work and had brought her crystal ball with her to use as a prop. This was the image that was chosen. Now one of the things that Cath actually wanted was a smoky atmosphere to create a more mysterious mood. She had promisd she was going to bring incense sticks to create this atmosphere – but forgot. So we had no smoke source (must remember to put smoke bombs on my shopping list). I also wasn’t happy with the appearance of the crystal ball – I felt it should have something in it. So I spent a little time in Photoshop and added a swirl of smoke and a misty castle turret. I also put the suggestion of smoke into the background. Real smoke might have looked better, but Cath loved this version of her image.